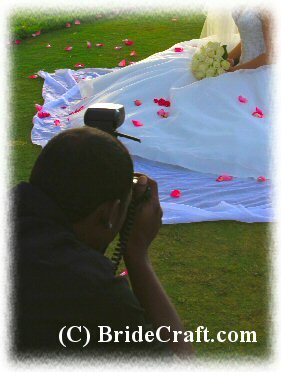 Looking for some great wedding photography tips to help you save? Today’s budget bride wants to be able to save on photography, and still get great photography options. This is one area where I would advise you to be very selective with your choices and think it through carefully before you make your final decisions. Your wedding pictures will be extremely important…maybe one of the most important choices associated with the wedding planning. You will want to have good quality to capture this incredible event forever. This being said, there are still tons of wedding photography tips to help you save on wedding photography today! 1. Hire an apprentice. While you should be leery of hiring a new student, or an amateur who seems to do well, consider someone who has been the background guy. Many photographers will have assistants who work with them to capture all the details in the form of apprentices. They act as a back up photographer to get additional angles and detail shots that the main photographer may not be able to capture if he’s busy elsewhere. These apprentices and back up photographers have done everything from getting the extra angles, décor, cocktail shots, etc, to helping the main guy set up and break down equipment, scout out nice shooting locations, crowd control and formal posing. They are familiar with their equipment and lighting, as well as how to maneuver a wedding party. These photographers may offer better pricing to you so that they can add your wedding to their portfolio and get their name out there on their own. 2. Go with the pro and skip the prints. When interviewing your potential photographer, ask about getting a CD of your images as opposed to a printed proof and purchased prints program. This is becoming more common in the digital age, and they most likely will have done this already with previous clients who wanted to save on wedding photography. Be sure that a printing release signed by the photographer is included in this deal. You can print from any convenience store or online printing company from the CD, but many will NOT print a professional’s work without a release. This is a practice that is in place to protect the creative rights of photographers, so be sure to have a written release from yours so that you do not run into any problems. 3. Touch up the images yourself. Handy with image editing software like Jasc or Adobe Photoshop? Do your own touching up and editing. You have the benefit of being able to STOP editing when you’re happy, or keep going if you feel like you’d like to see an image change some more. You may be able to skip some cost this way if your photographer charges for editing, or if he out sources to a company that does his finishing. 4. Make a call to your local newspaper. This is a wedding photography tip you may not have thought of, but newspapers employ several photographers. They don't specialize in weddings, but most are skilled and talented, and would probably appreciate the opportunity to earn some extra cash. You may also find their style of photography to be along the lines of photojournalism, which you may love. As always, interview these photographers first, and determine if they would work for your wedding. 5. Scrap the wedding album idea. Literally. You and your new hubby can have a fun time organizing your own photo album or scrapbook, skipping the high cost of the pro’s professionally printed album. You can include your photos chronologically, as the pro would, but add special details that have sentimental meaning to you and your new husband. Another fun idea is to use the photo album option of an online printing company, such as Snapfish or Shutterfly. They have several options that are perfect for DIY brides and grooms. Something nice about this is that they come bound in a book, smooth pages and clean lay outs. Be careful as this can add up too if you begin adding many extra pages to the book. 6. Bundle services. It seems everything in the world is coming in bundles these days! The same goes for some areas of your wedding. These days, it's popular for photographers, videographers and DJ's to bundle their services. This means more exposure for each of their businesses, and more sales. Sit and evaluate how you feel about the companies, and then do the math. You may be pleasantly surprised. Bundling is a wedding photography tip that may help you save. 7. Skip the "getting ready" photos. Pros sometimes charge by the hour. A trusted bridesmaid and groomsmen can take care of this part of the wedding day photography (if it’s even something you feel you want at all!). This can save you an hour or two's worth of fees with the photographer, which translates to a lot of money. While you may be looking for wedding photography tips to help you save, you don’t want to miss your once in a lifetime chance to capture the joy of your wedding day. Take your time, be selective, and make choices regarding photography that you are confident about so that you can enjoy your photos for years and years to come. 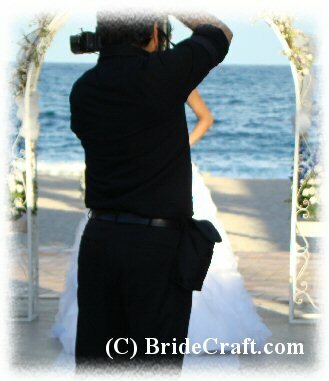 Return Wedding Photography Tips to Wedding Article Library.